Officially hurricane season is from June 1 – November 30, but August- October are usually the most active time. For that reason most of the boats are in the boatyard and the crew on vacation, but SEA OF LOVE stays the whole summer. Here are some of the reasons joining them during that time. 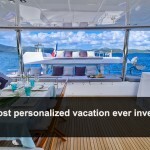 “Drop the scary hurricane season part, fill in with “OFF OFF Season” and in my opinion you have the best time of the year to sail the BVI. You can have the beach to yourself. Isn’t it everyone’s dream to find that secluded island beach and have it all to yourself? Well, come sailing in Aug, Sept or Oct and almost every island and anchorage will be a deserted. 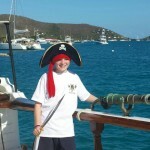 Fellow charter boats are so scarce you might see no more than one or two in an entire day. The rest of the year we have to plan each day to be on a mooring for that evening in time before they fill up, and that can be already at noon in some places like Cooper Island. During “Off Off season” you can arrive when you want and there will always be available moorings. What a relief or should I say pleasure? Of course you will have to bring your own party wherever you go. Don’t count on those other hundreds of charter boats that are put away for the “Off Off season” to make up the party. It is really a time to enjoy the BVI at your leisure; snorkeling, diving and beaching with your own special group of friends or family. You will also have to plan well to find an open restaurant or bar. So join us and wonderful meals will be served when and where you want by my wife Carol who is a great chef. Really though, the likelihood of a hurricane finding you while down here for a week is pretty small and Sea Of Love will credit any lost time from a hurricane to a future vacation period.
. . . .and don’t forget that if a hurricane does come, there will be plenty of warning and you will be set ashore while we take care of the boat! This blog has been written by Joe who along with his wife Carol are owner/operators of the of the crewed catamaran SEA OF LOVE. 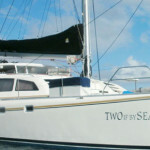 It is a Lagoon 440 with room for up to 8 guests and they would love to show you around the BVI. You can meet them in this VIDEO and see what they have to offer.